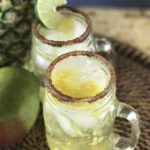 A 100 calorie pineapple margarita is the perfect summer drink. It’s just bubbly enough to be refreshing and it’s low on calories so it’s guilt free! Having an empty margarita glass is no fun, this easy recipe can solve that problem. Why should I use sparkling water in my cocktails? Sparkling water is my go to drink when I need some bubbles. The great thing is that the flavored varieties also make an awesome addition to cocktails. It doesn’t add any calories or fat and it provides just enough bubbles and flavor to enhance my favorite tequilas. Is this a delicious summer recipe? 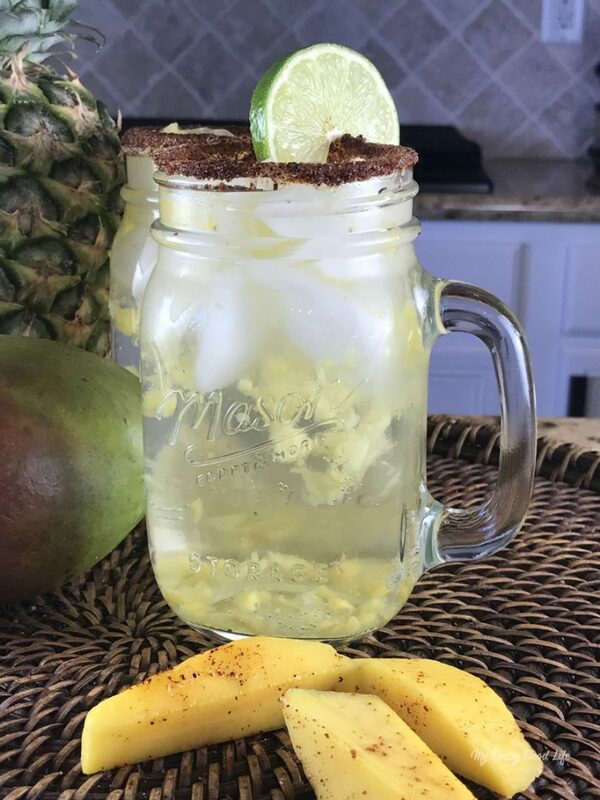 If you missed my 100 calorie Pina Colada you can check it out for more sparkling water cocktail inspiration! 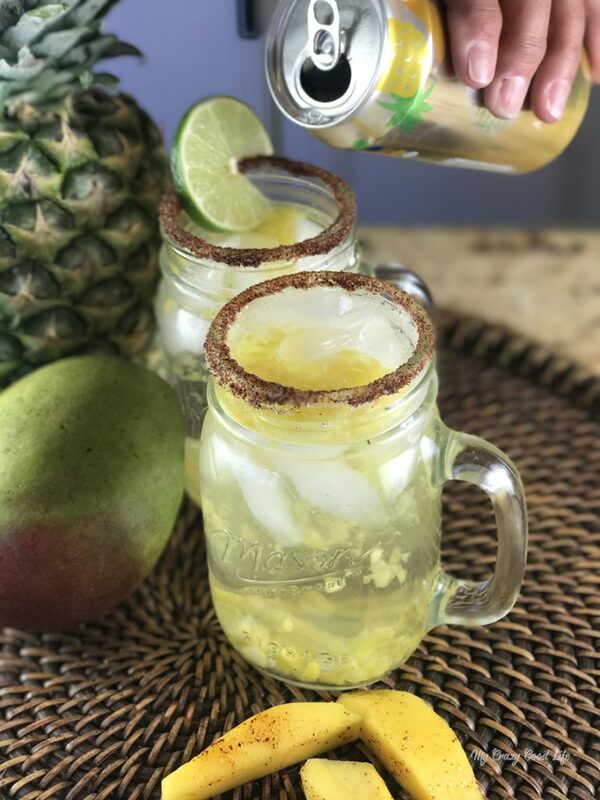 This 100 calorie mango-pineapple margarita recipe is very refreshing and I’d definitely recommend you give it a try this summer. It’s a great poolside drink and it’s quick to make for those last minute backyard BBQ’s and parties. 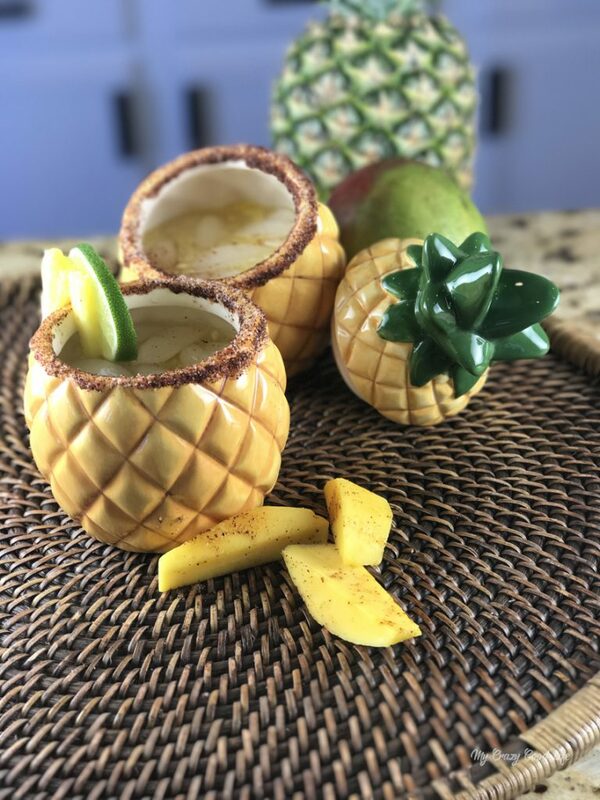 Where can I get these adorable pineapple cups? Is this a low calorie cocktail recipe? This recipe is low on calories and even lower on difficulty. It’s a quick and easy recipe that you can whip up in a large batch or make a glass at a time for yourself! 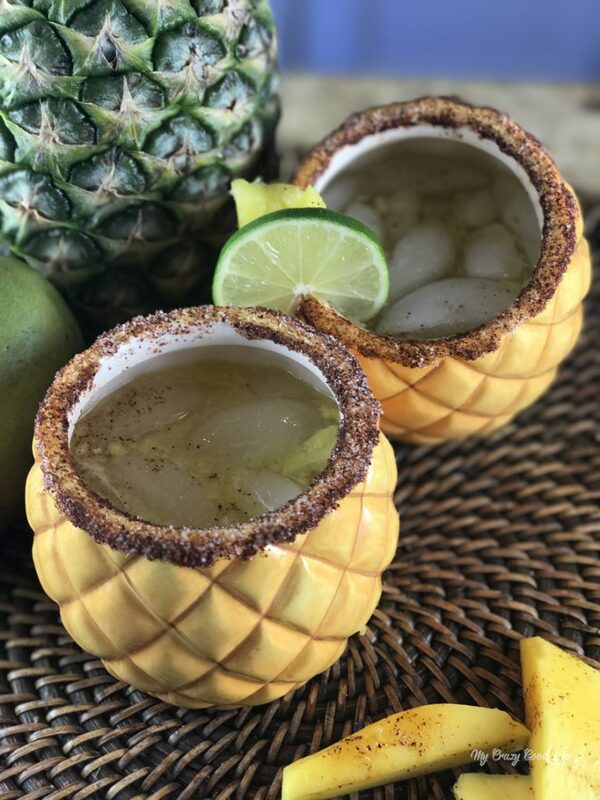 What do I need to make this delicious pineapple margarita? Can I use regular pineapple sparkling water? Sure! I think the mango pineapple variety gives this a more festive and tropical taste but you can use pineapple flavored sparkling water on its own if you prefer. Do you have a book of margarita recipes I can print or download? Yes! I do! After a bunch of requests I rounded up all of my favorite recipes for margaritas and put them into an ebook. You can view and purchase it so you can print all the recipes or keep it on your device for easy access. 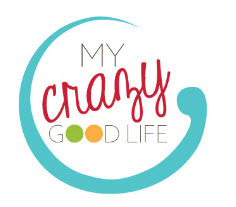 Crazy Good Margaritas | A Printable eBook of Margarita Recipes includes a bunch of recipes that I’ve shared here at My Crazy Good Life. They’re some delicious options that your friends and party guests will love. Rim the glass with lime juice and tajin mixed with sugar. Next, squeeze in the juice of 1/2 of a lime. Add sparkling water (I used Pineapple-Mango) to top off the glass. Optional: Muddle pineapple and add to glass. Do you have any other margarita recipes? You must be new here ;) but yes! I certainly do, margaritas are my favorite! If you are a fellow margarita lover make sure you check out all of my margarita recipes here. 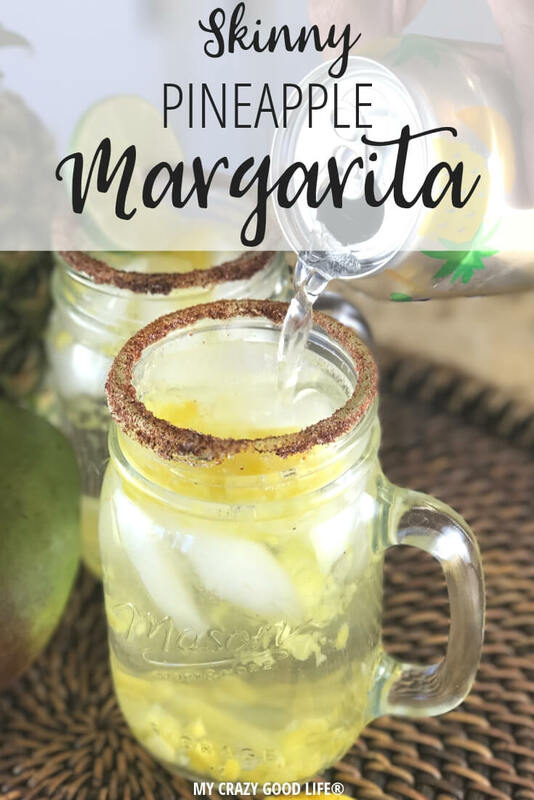 All of my favorite margarita recipes are great for parties, lounging by the pool, or game night with friends. There are a lot of great choices so you’ll never get bored! Thanks to the many varieties and flavors of sparkling water the possibilities are endless. Is this a blended margarita? Can I make this into a frozen margarita? No! I’m kind of a margarita purist. I don’t usually blend my margarita recipes but that doesn’t mean you can’t. Blending margaritas is just another step in the cocktail making process for me. I prefer mine over ice but you could definitely blend all the ingredients and enjoy the slushy variety! If you want to make this into a frozen margarita just add ice and everything else to a blender. About 6-8 cubes of ice per drink should do the trick. You can always add more as you like to get your preferred consistency. What kind of glasses should I use for margaritas? Some people prefer a classic margarita glass, others (like me), will enjoy a margarita in a festive glass or a paper cup! Here are some awesome margarita glasses that you can choose from. Everything from crystal to whimsy in this collection. I even have a DIY margarita glasses post you can explore if you are feeling a bit crafty! A 100 calorie mango pineapple margarita is the perfect summer drink. It's just bubbly enough to be refreshing and it's low on calories so it's guilt free! Add ice and tequila to margarita glass. Add sparkling water (I used Aquafina Pineapple-Mango) to top off the glass.